Easter is right around the corner and you know what that means. There are Easter baskets to be filled, chocolates to unwrap, eggs to be dyed in multiple colors, and, of course, cookies to be decorated with springtime colors. 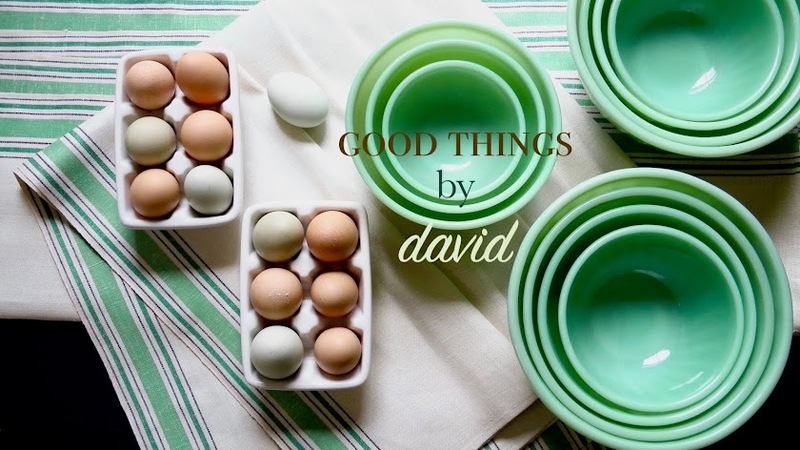 Over the course of the few years I've been writing, photographing and creating for Good Things by David, Easter has had a special significance for me. This time of year happens to coincide with my niece's birthday, so extra care is taken in making the best of the very best. 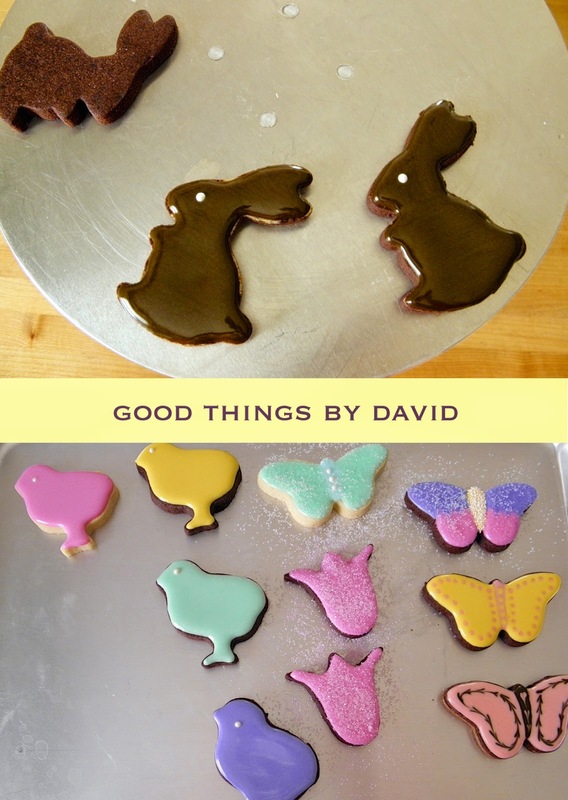 I've culled from my photographic library some of my favorite images of the Easter cookies that have flown the coop and made their way to the west coast. It's nice to look back at these beautiful cookies, because there is always so much to learn and remember from year's past. 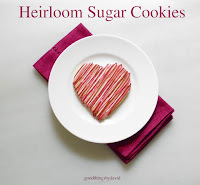 Rather than post one long string of photographs, I decided it would be best to present photos with a few tips & techniques for you cookie decorators. What I loved about these particular designs was that I kept everything very simple. With a handful of pastel colors in shades of Easter, I embellished tasty sugar cookies with a good royal icing and some pearl candies. None of the designs were intricate. In fact, most of the cookies were simply flooded with icing. 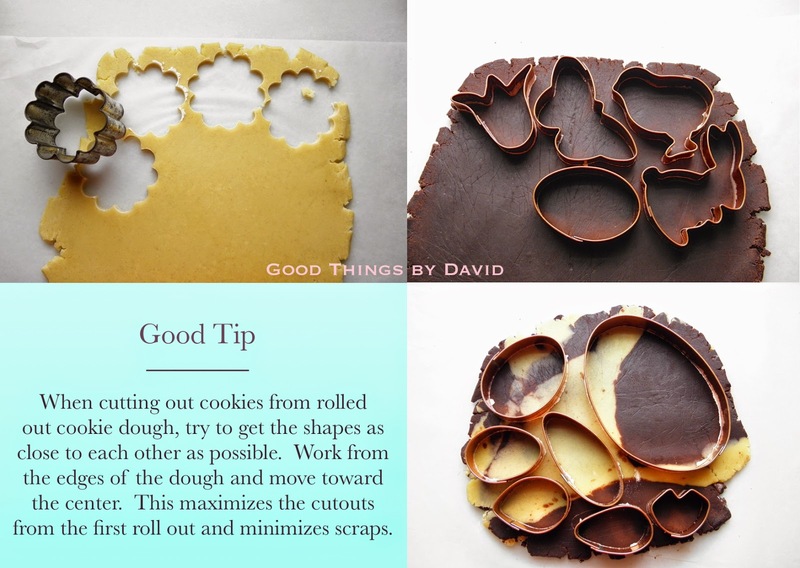 Here's a good tip: always start cutting out your shapes from a slab of cookie dough around the edges of the rolled out dough. Try to get the shapes cut out as close together as possible. I can't stress this enough. Not only do you get more cut outs from the first roll out (most doughs can be rolled out a few times), but you also get less scraps this way. I love Sugar Cookies and Chocolate Cookies to eat and to decorate. When I have leftover doughs from both of these, I roll them out to create marbled cookies. Who doesn't love marbled doughs? I highly recommend having one's cookie decorating station ready to go with the necessary sugars, candies, sprinkles, pearl candies, dragees and various decorating tools, laid out and organized. When working with royal icing, which tends to set rather quickly, the last thing you want is to have to go searching for something at the last minute. In a future post I will let you know what I feel is essential in a cookie decorating kit. 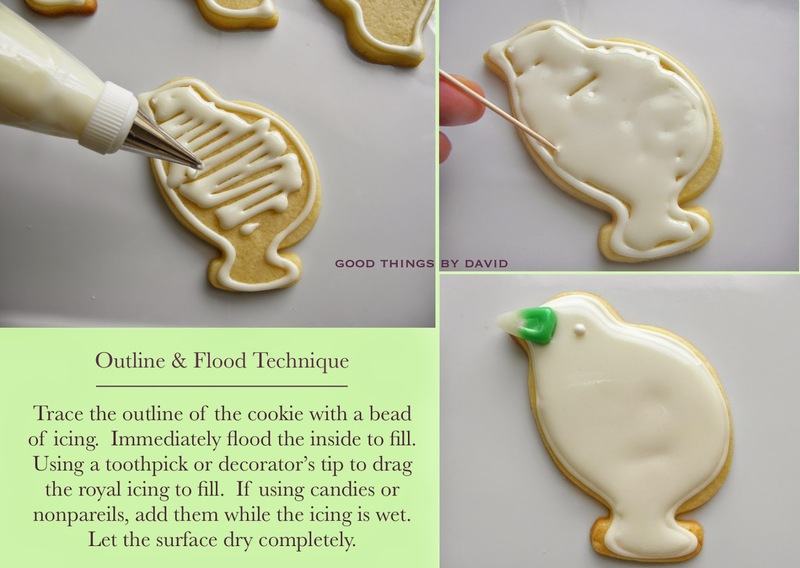 To Outline & Flood a cookie is basic and simple. 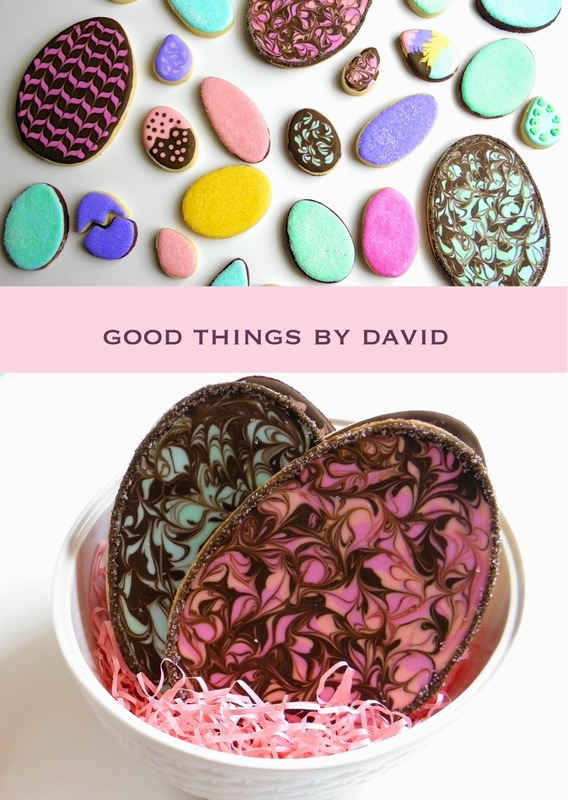 All you need to do is pipe a border (bead) of icing along the edge of the baked cookie and then immediately go back with the same icing and fill the area(s) in. Remember that while the royal icing on the cookie is wet, you may add whatever sweet edibles now. Don't disturb the cookie until it sets completely. 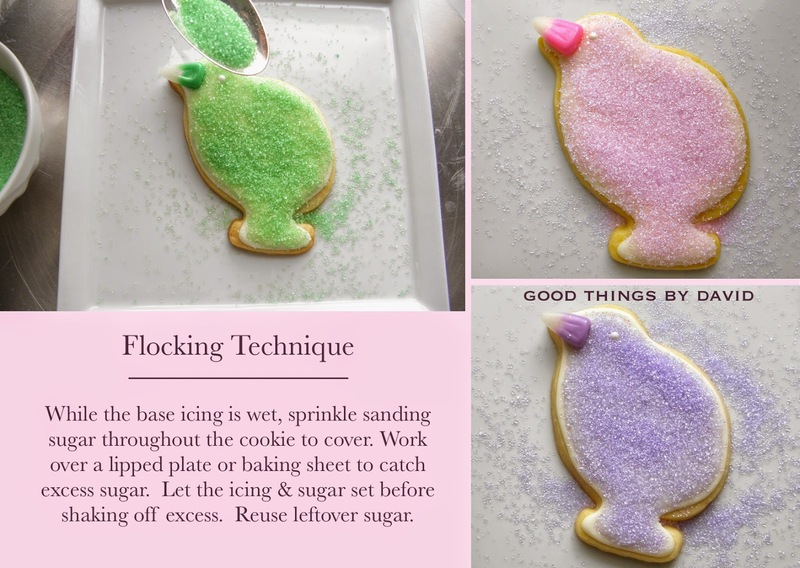 Flocking a cookie with fine sanding sugars is completely optional, but it does add another dimension, texture and sparkle to any shape. This should be done while the base icing of the cookie is still wet. 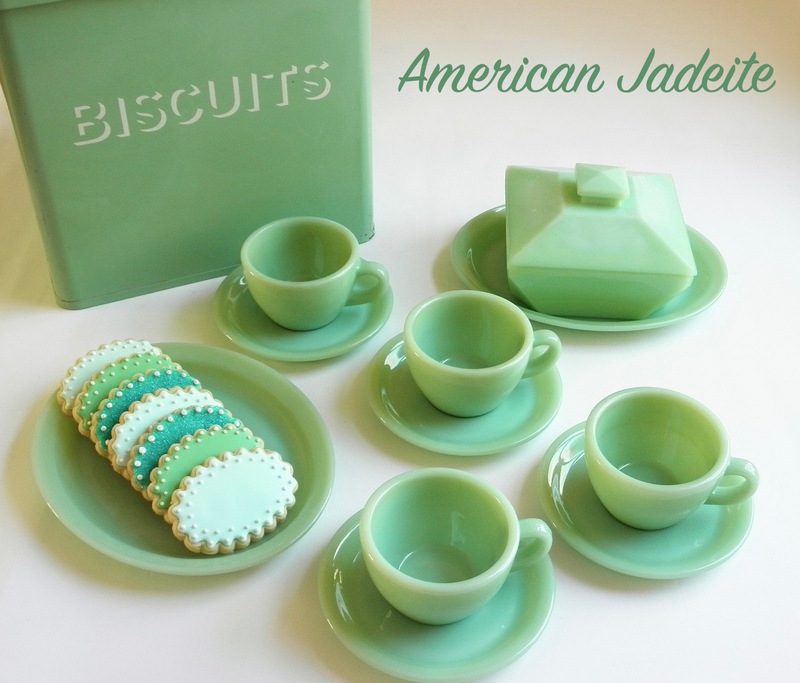 As you can see from the photo with the green hatchling, set the cookie to be flocked on a rimmed plate or a small baking sheet with a rim, and then sprinkle the sanding sugar liberally. Let that set before shaking any excess off. Whatever falls onto the plate can be put back into its appropriate container and be used again. Good Tip: work with a cake decorator's stand to ice cookies, because it makes maneuvering and working around a cookie very easy. If you're piping icing and find that the angle of a certain cookie is awkward, simply rotate the cake stand to position the cookie just so, and then continue. Set your cookies that need to dry on clean baking sheets which can be stacked on a shelf. Easter Eggs can be just about anything you desire. From pastel-hued and sparkly, shimmery eggs to polka-dotted creations and marbled works of art. All you need is a handful of tools, some colored icing and a little imagination. 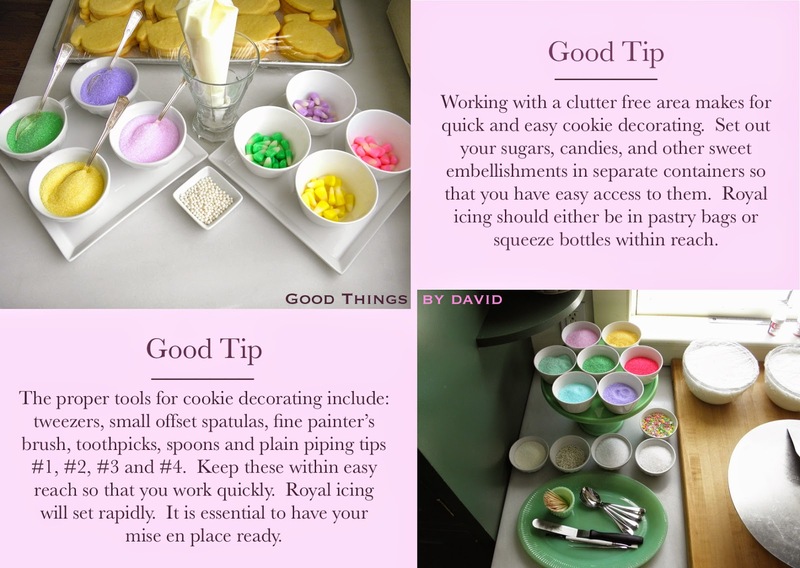 Those giant marbled Easter eggs were made by piping three different colors haphazardly throughout the base of the cookie, and then dragging a decorator's tool (or toothpick) throughout it to create a swirl design. These adorable Easter Eggs can get tucked into baskets for gift giving or they can be displayed on a cake stand like this for your gathering. If you want, you can even make a cracked egg to add a bit of whimsy. If you want to see a complete tutorial on these particular cookies, click here. 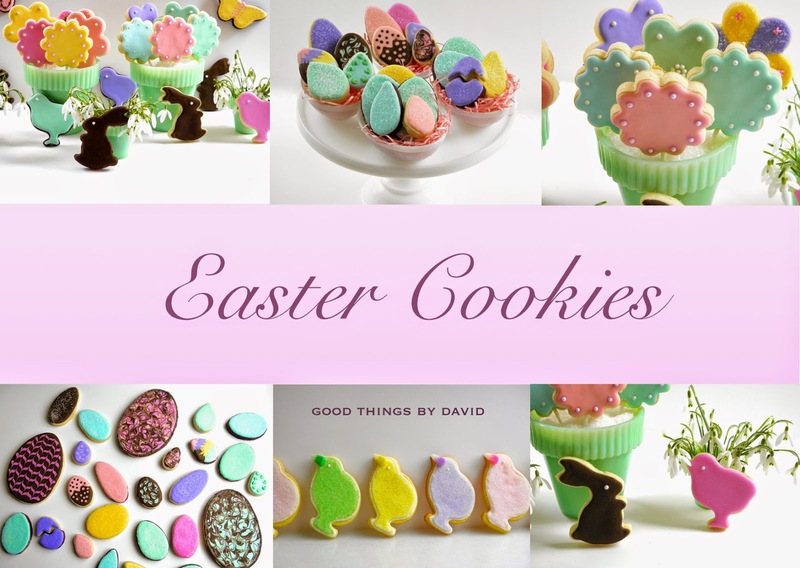 Even if you don't have time to make my Easter Cookies in the coming weeks, bookmark this page so that you can make them for a spring gathering or some other special occasion. I can see an entire flock of bunnies, chicks and butterflies for a baby shower or even a spring wedding tucked into cellophane bags or clear-top boxes. They could also be displayed and propped up against a tower of cake stands for a dessert buffet. Most importantly, remember to have fun decorating your cookies this season. You are so clever David. This post really shows your passion and creativity in so many ways - thank you. Absolutely adorable!!!!! I think they are gorgeous! Those chicks and rabbits are to cute to eat. I love Easter. Coco and Lisa, Easter is one of my favorite holidays, because I have great memories of it from when I was a kid. Thanks for liking the photos and cookies! Nathaniel, the marbled cookies taste really good! You can leave them as is and not even bother with royal icing. Try making some. Ok I still think u should take orders. Ha ha. Just from you're blog followers! Please.